Playing at home on senior night and homecoming, the Cowboys couldn't have gotten off to a better start. Dominic Langley took the opening kickoff and raced down the left sideline all the way to the Woodburn 26-yard line. Five plays later, Kyle Knudtson carried the ball into the end zone on an 8-yard run up the middle. The two-point conversion attempt failed, but the Cowboys led 6-0 just 1:45 into the game. That lead didn't last long, however. Luis Rodriguez took the ensuing kickoff down the right sideline 80 yards for a touchdown, and the score was tied just 16 seconds after Knudtson's touchdown. The extra point attempt was blocked, and the score was tied. That's the way the score remained for the rest of the first half. Rodriguez took the kick to open the second half and returned the ball to the 45-yard line. From there, the Bulldogs went on a 14-play, 55-yard drive that ate nearly six minutes off clock. The drive might have stalled except for a personal foul on Crook County that gave the Bulldogs a first down just inside the 10-yard line. R.J. Veliz eventually scored on a 6-yard quarterback keeper. Veliz then hit Elias Barajas in the corner of the end zone for the two-point conversion, giving the Bulldogs a 14-6 lead midway through the third quarter. "We knew we were going to do that," Veliz said. "At half time, we knew we were going to get our offense going. We knew we had to put points up on the board, and we executed our game plan. The line played a great game, especially on that drive. They pushed and they led us all the way to the end zone. It was them. It wasn't any of the running backs or anything. It was the line." The Cowboys took the ensuing kickoff from their own 18-yard line and quickly drove down the field, finally scoring on a 14-yard run by Langley. Crook County lined up in a spread formation to attempt to tie the score on a two-point conversion. The center snap went to Erick Gonzalez, who appeared to get into the end zone. However, the officials ruled that he had touched a knee to the ground before the ball crossed the plane of the goal line. "It could have been overtime right now," Gonzalez said following the game. "I was in the end zone. It should be 14-14, and we should have gotten that two-point conversion, but that's the refs' decision, not ours." That turned out to be the difference in the ball game. "That stop was huge," Federico said. "We were waiting for that all week because they showed that once earlier in the season, and our kids aligned correctly, and they played it really well. That was a big stop." Neither team was able to score in the fourth quarter, although both teams moved the ball at times. 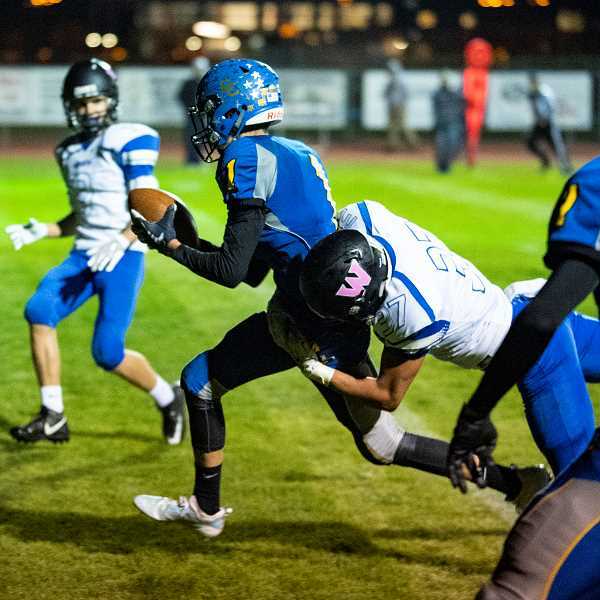 The Cowboys had one last chance to score late in the game, driving all the way to the Bulldog 20-yard line, but on fourth and 6 with time running out, a Woodburn defender was able to deflect a Brody Connell pass, which fell harmlessly to the ground. "Unfortunately, we had a lot more penalties this week, and they came at really bad times," Cochran said. "That was a tough loss, especially for our seniors on senior night and homecoming. We put a few drives together, but we would get going, and then all of a sudden, we would have a penalty that put us with long yardage. That was the story of the night." From there, the Bulldogs took a knee as time expired. "It's a huge win for us," Veliz said. "We've lost by a combined three points the last two weeks. Getting this win means a lot. We didn't play our best, but that just means that we are trending upwards going into the stretch run of our season, and we are going to make a fight. We aren't going to back down from anybody." The Bulldogs were able to win, despite managing just 132 yards of total offense. Woodburn managed just 96 yards rushing and 36 yards passing in the contest. Despite holding the Bulldogs under 150 yards of offense, Gonzalez, a linebacker, was disappointed with some of the mistakes that the Cowboy defense made. "We got good plays called back because of stupid decisions," he said. "Fourth down and we jump off sides. We have good defense and then a face mask and it put us in a worse position. The effort was definitely there, but we really could have had smarter choices." The Cowboys weren't much better offensively, picking up 269 yards of total offense. With the win, the Bulldogs improved to 2-2 in league play and 5-2 overall, while the Cowboys fell to 1-3 in league and 3-4 overall. "This gets us to five wins," Federico said. "We needed to get this because it is going to help our playoff chances." Meanwhile, despite the loss, the Cowboys are still in post-season contention. With 12 teams earning automatic berths to the playoffs, the next eight teams in the power rankings will earn play-in games, vying for the four remaining playoff spots. Heading into the game, Woodburn was 18th in the power rankings, while Crook County was 19th. A win next Friday night against Estacada, 6-1 and fourth in the latest OSAA power rankings, just might be enough to vault the Cowboys into a play-in game. 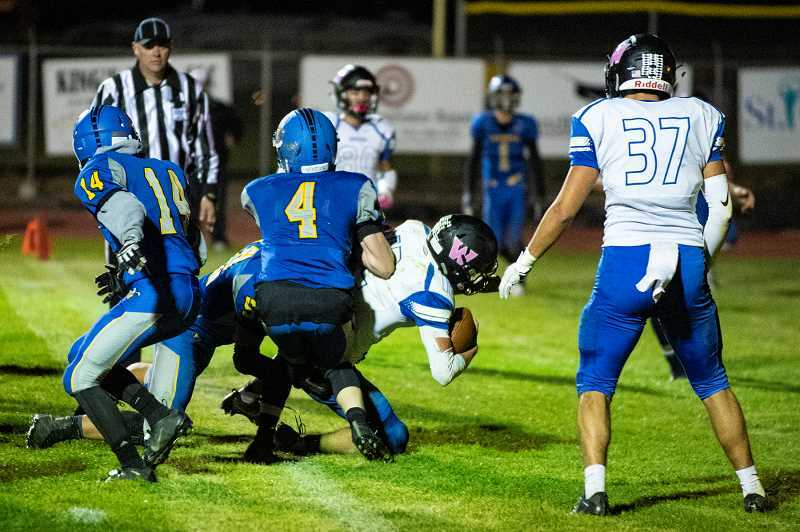 The Rangers defeated The Dalles 44-22 Thursday night. However, they were just barely snuck by Woodburn two weeks earlier, taking a 14-12 victory. Woodburn will close out their regular season with a home game against the Gladstone Gladiators, currently ranked third in the power rankings with a 5-2 record. Both games are scheduled to begin at 7 p.m.
CC – Kyle Knudtson 8-yard run. Pass failed. W – Luis Rodriguez 80-yard kickoff return. Kick blocked. CC – Langley 14-yard run. Run failed.